As regular readers of Interesting Thing of the Day know, I’m not what you’d call a sports enthusiast. Only on the rarest and most unusual occasions can I be persuaded to watch a sporting event, and even less often do I participate. This is partly because I’m not a very competitive person myself—and in general, I don’t like being around those who are. This attitude extends (again, only with occasional and very particular exceptions) even to board games, card games, and the like. They just don’t do anything for me. I’d rather have a conversation, or read a book, or go for a jog (as long as it’s not a race). On the other hand, I do frequently need to make binary decisions, especially of the “which-one-of-us-gets-to-perform-the-unpleasant-task” variety. If my wife and I are trying to determine which one of us will take out the garbage, do the laundry, feed the cat, or whatever, we will sometimes employ the time-honored method of using a binary random number generator (a coin toss). Other times, we resort to playing “rock, paper, scissors,” an ostensibly random decision-making technique at which I invariably lose. 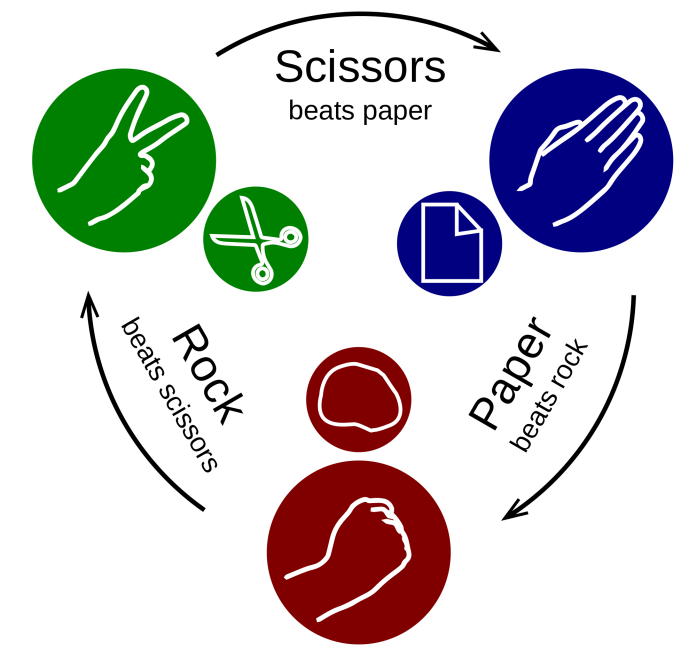 For the benefit of those few readers who may not be familiar with this game, two players simultaneously form their hands into one of three configurations: “rock” (a fist), “paper” (fingers flat), or “scissors” (first two fingers in a V shape). Each shape “wins” against one other—scissors wins against paper (“scissors cut paper”), rock wins against scissors (“rock dulls (or crushes) scissors”), and paper wins against rock (“paper covers rock”). If both players make the same choice, it’s a draw and the procedure is repeated. Variations on this game have appeared under many different names in countries around the world; some precursors to “rock, paper, scissors” are thought to date back to 200 BCE. Now I discover that all this time I’ve been unwittingly participating in a sport. Incredible but true: an amazing number of people around the world take part in entirely serious competitions of “rock, paper, scissors” (or RPS, as it is known in the lingo)—with prizes ranging in value from the hundreds to the hundreds of thousands of dollars. There are local, regional, national, and international Rock Paper Scissors tournaments, a The World Rock Paper Scissors Association (based in Ottawa, Ontario), and even multiple books on RPS strategy. Strategy? Yes indeed. That’s the whole point of the competition—RPS is not truly random. For one thing, many players follow patterns (either consciously or unconsciously). For another, skilled competitors can look for subtle clues to what their opponent’s next “throw” will be and counter by altering their own throw at the last moment. Likewise, there is a whole range of miscues one can learn to perform in order to fake out an opponent or even bias them toward selecting a particular throw. (You can learn about many of these things in The Rock Paper Scissors Handbook by Wyatt Baldwin, president of the The World Rock Paper Scissors Association, or in The Official Rock Paper Scissors Strategy Guide by Douglas and Graham Walker, leaders of the World RPS Society (which appears to be much less active these days). Professional competitors must come to an agreement about the number of “primes” they will use (primes being the preliminary arm movements used to synchronize the throws); for the World Rock Paper Scissors Association, there are three—the actual move is shown on the fourth movement. In some competitions, the allowable hand configurations are also prescribed in detail—for example, “paper” must always be horizontal, not vertical like a handshake. And of course, players must be careful to form their chosen hand symbol before the arm reaches the 90° point. In tournament play, a referee verifies that players abide by the rules and arbitrates disputes. At an RPS tournament, players usually compete in a series of elimination rounds. Each match consists of two sets of three games each. Match winners advance to the next round; losers are out of the entire competition. Some RPS tournaments attract thousands of participants, and a few—with large prizes and lots of publicity—have even been broadcast on ESPN. I can’t decide whether I like the idea of RPS tournaments or not. On the plus side, the game’s got simplicity going for it, and a high wackiness quotient. It’s also less violent than, say, football or hockey, and perhaps the least time-consuming sport I can think of. On the minus side, calling it a “sport” in the first place stretches the meaning of the term considerably. (Come to think of it, maybe that’s a plus.) More importantly, the revelation that it’s not really random at all makes it less attractive as a means of settling a disagreement. I can live with the arbitrary decision of a coin toss, but I hate to think my ability to weasel out of doing dishes depends on my skill in faking “rock” to trick my wife into throwing “paper,” only to switch to “scissors” just before my arm reaches level. Given the choice, I’ll pick housework over sports any day. Note: This is an updated version of an article that originally appeared on Interesting Thing of the Day on March 11, 2005.